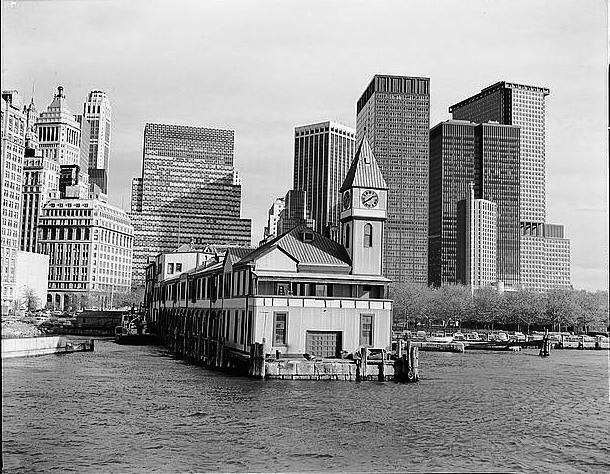 In 1884 the New York Department of Docks was just 14 years old when it began plans for a headquarters building. Established by the State Legislature in 1870 the department was charged with the formidable task of developing the waterfront. This included building of piers, wharfs and seawalls; a complex project that was laid out by Chief Engineer and Civil War hero General George McClellan. At the same time that the Department of Docks was considering its new headquarters, the New York Police Department was in need of a station house to accommodate its one steamboat, the Patrol. An impressive building built on a pier was conceived – but there was a problem. The pier was not part of McClellan’s 1871 plan and, therefore, not part of the State’s approved apportionment. 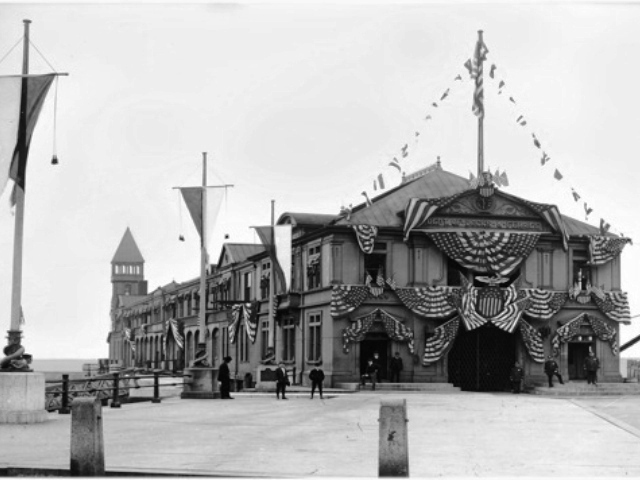 The State Legislature amended the plan in 1884 to allow for the construction and on July 3 the Board of Commissioners approved the erection of the pier. The pier itself was an engineering feat that took a full year to complete. Not until September 1884 did the construction of the building begin. Completed in 1886 it was an attractive, late Victorian delight of brick and terra cotta with iron trusses supporting the tin roof. A wood-frame tower over the river was used as a look-out by the police, who occupied the north section of the pier. 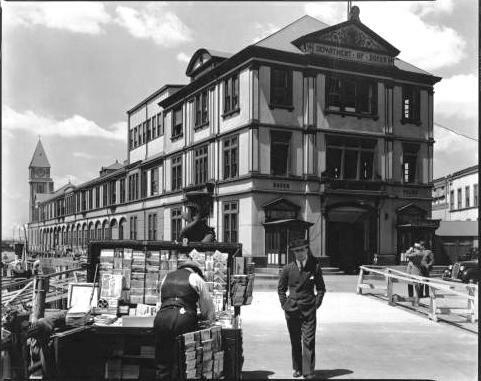 The Docks Department occupied the rest of the building for its offices and storerooms of maps and records. 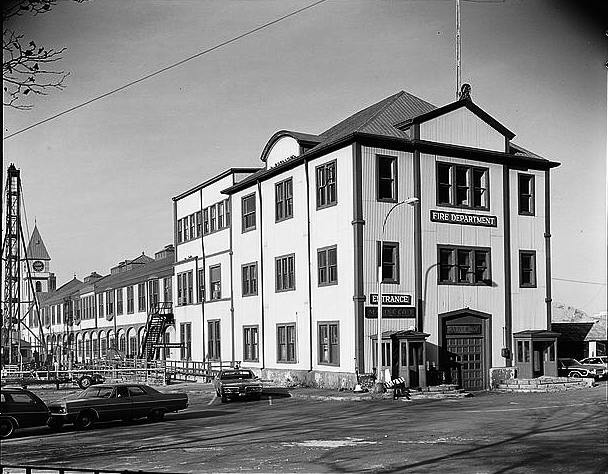 To protect the workers from the onslaughts of winter weather, the building was highly insulated. Two layers of tar paper, mineral wool between the studs and a layer of tongue-and-groove paneling prevented the worst of winds and cold to permeate the offices. He did not mention how the officer worker could bear to work in the extreme heat. 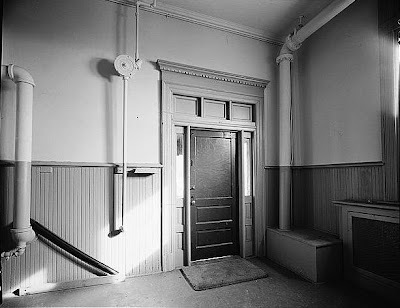 To accommodate the Department’s increasing need for space, in 1900 a three-story addition was built at the shore-end of the pier and in 1904 an additional story was added towards the shore end. The additions were frosted with Beaux Arts ornamentation—wrought iron lamps, scrolls and leafy decoration. The result, rather than an accumulation of mismatched architecture, was a charming structure that could have been plucked from a child’s electric train set. Painted in three colors, the sections blended harmoniously into a quaint Victorian whole. Department of Docks employee Joseph J. Madden was working at his desk on September 21, 1917 when he heard cries from the waterfront. Below, a boy named William Murphy had fallen into the river and was being pulled out by the tide. Madden dived, fully dressed, into the water, swam 200 feet to the drowning boy and “brought him with great difficulty to a float, to which both were assisted,” according to the Report of the Secretary of the United States Treasury. The worker was awarded a Silver Congressional Medal for his bravery. The bell weighted 1,000 pounds and struck ship’s time, “the only public clock in the world striking ship’s time” according to Greater New York magazine at the time. The clock was dedicated with great fanfare at noon on January 26, 1919 and was presented to Dock Commissioner Murray Hulbert for the city, and Mayor General David C. Shanks on behalf of the army, by Rear Admiral Josiah S. McKean. The glass dials were illuminated at night, turned on by an automatic mechanism. According to The Jewelers’ Circular, “The clock is guaranteed by the makers to operate within a variation of 30 seconds per month.” To maintain the dignity of such a prestigious memorial, which the Annual Report of the Department of Docks and Ferries stressed was “the first memorial of the World War erected in the United States,” Pier A was given a $2,280 paint job. And so it was. The Beaux Arts scrolls and pilasters were trashed in favor of aluminum siding; certain to be less of an “eyesore.” The tower clock, erected to the memory of military men who died in service to their country, no longer worked and its original purpose long forgotten. As it was, the city’s financial problems were the sole reason that Pier A stood at all. Plans had been underway to demolish the pier to make way for office towers and a new marine facility. But as the city’s fiscal crisis worsened and with several million square feet of vacant office space in lower Manhattan, the plans to build office towers were abandoned. While the city vacillated in its development plans, historic preservationists were less hesitant. In 1975 they were successful in having Pier A listed on the National Register of Historic Places. With this designation the restoration costs would be shared, with matching grants from the Federal Government and the state. 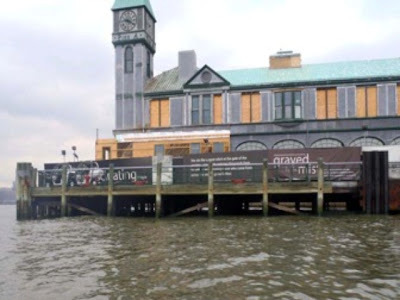 The Department of the Interior and the New York State Department of Parks and Recreation each contributed $90,000 earmarked for restoration of the clock tower, roof, underwater pilings, arched windows and upgrades to the electrical and mechanical systems. Designated a New York City Landmark in 1977, Pier A sat quietly, but neglected, at the base of the island. In the 1980s it was closed off by a construction fence where, less than a decade after its restoration, it began to deteriorate. 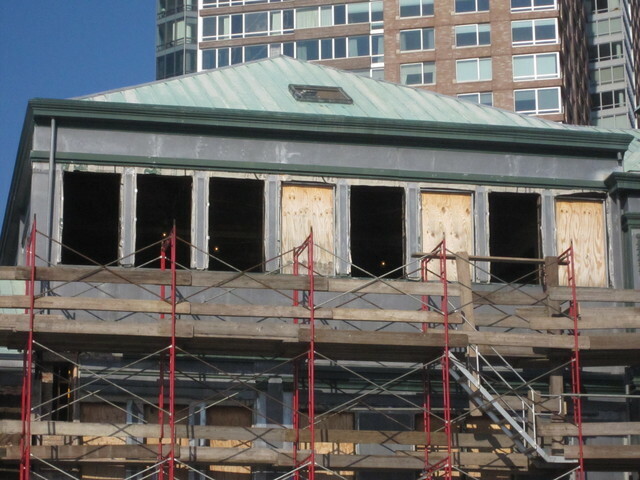 In 2008 the Battery Park City Authority took over the structure. In 2010 a $30 million overhaul was planned, including a surrounding plaza; but immediately problems arose. There was no money set aside for the plaza, the general contractor and construction manager dropped the project and the budget was slashed. By January 2012 the cost of restoration had risen to $36 million and the structure was found to be in drastic disrepair. “There was a significant amount of water damage, rot and structural deterioration,” said Gwen Dawson, Senior Vice President of Asset Management for the Authority at Community Board 1 meeting. Restoration of the charming Victorian pier continues; but wanton neglect nearly took away an irreplaceable landmark.